Bill Snyder has earned the moniker “The White Wizard” of college football and RB John Hubert is another one of his small frame, big game minions. Photo by JMR_Photography. What drives you crazy more: getting whooped or losing a close battle to someone who you think you should have dominated? For me it’s the latter choice because it’s one thing to believe you gave your all and weren’t ready to compete at the same level, but an entirely different story when you think you left your A-game at home to a B-game opponent. But what if turns out that B-game opponent is a deceptive, A-game player whose skill is making you feel like a underachiever? For me, the jury is still out when it comes to assessing whether Kansas State RB John Hubert has an A-game worthy of the NFL, but there’s no doubt that if I were a Big-12 defender who just spent an afternoon chasing him around a football field I’d probably need a half-hour date with a heavy bag after the game. Listed at 5’7″, 191 pounds, I’d probably bet someone lunch that he’s not a shade over 185 and I think I’m being generous. The native of Waco, Texas broke LaDainian Tomlinson’s high school record, but hometown Baylor didn’t even sniff in his direction. 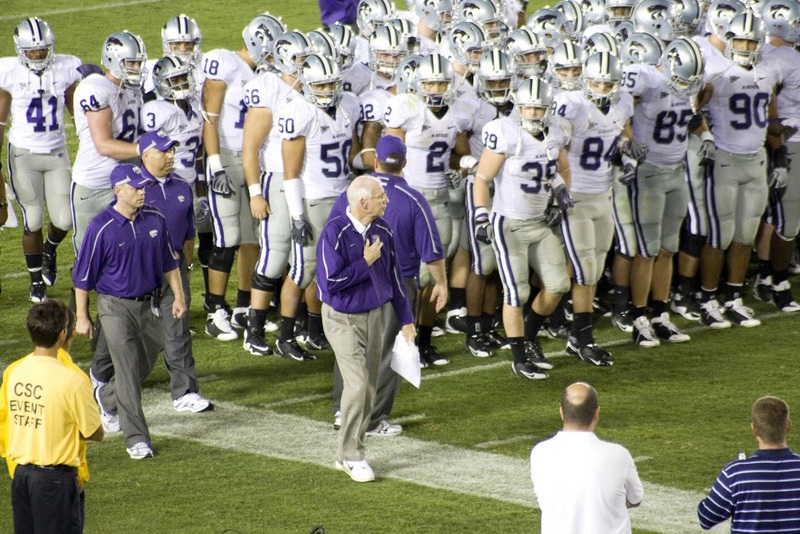 Enter Kansas State coach Bill Snyder, a man who knows a thing or two about small backs who play big. As I mentioned the other night on Twitter, the more I watch Kansas State’s offense the greater the admiration I have for Snyder. The K-State legend’s offense is one that coach Oklahoma coach Bob Stoops – a former Snyder assistant – says is like playing three different systems in the same game. What I especially like is the choice and timing of the constraint plays that K-State calls – often using the running game. Back to Hubert. The diminutive runner got my attention for his 23-carry, 130-yard, 1-touchdown performance in a 24-19 upset of the Sooners in Oklahoma last years. Don’t tell me how bad the Sooners’ defense was; instead, pay attention to how good Hubert was at defeating angles and slipping tackles. By my count, Hubert broke nine tackles and generated seven first downs on 24 touches. He got a lot of help from the play calls and execution of his teammates, but there are several attempts in this game where Hubert does something small that makes a big difference. Whether or not this will translate to the NFL is a question I’m glad I have more time to answer. Still, it was too much fun to watch Hubert and not share what I saw. If you enjoy the nuance of play calling and admire a player who knows how to play to his assets, some of these highlights are worth examining. 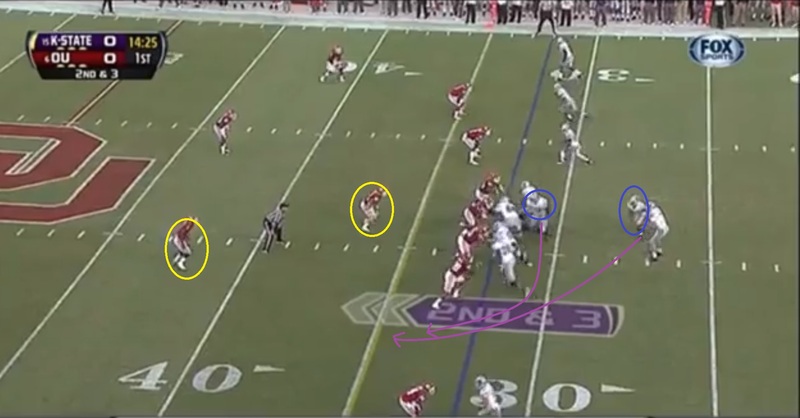 One of K-State’s bread-and-butter plays is a power sweep from a spread formation. This is a staple of shotgun football, especially mobile quarterbacks in the college game. However, I like the approach the Wildcats take with a 3×1, 10 personnel set because it’s not formation one expects to see a power sweep. 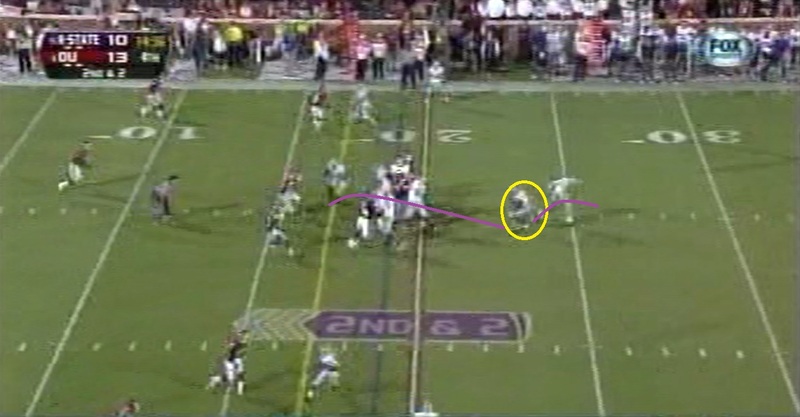 The beginning of the play looks more like a zone read quarterback option. The left tackle slants inside and leaves the defensive end unblocked as the quarterback fakes the exchange with the running back. 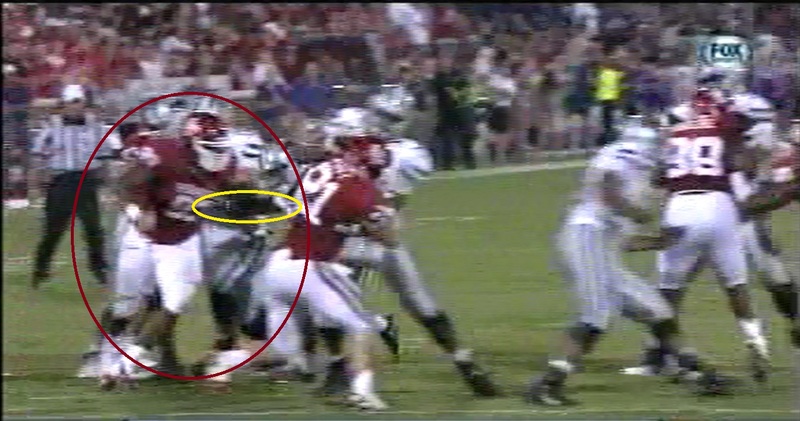 This draws the end to the middle of the field and puts him harm’s way with pulling right guard. 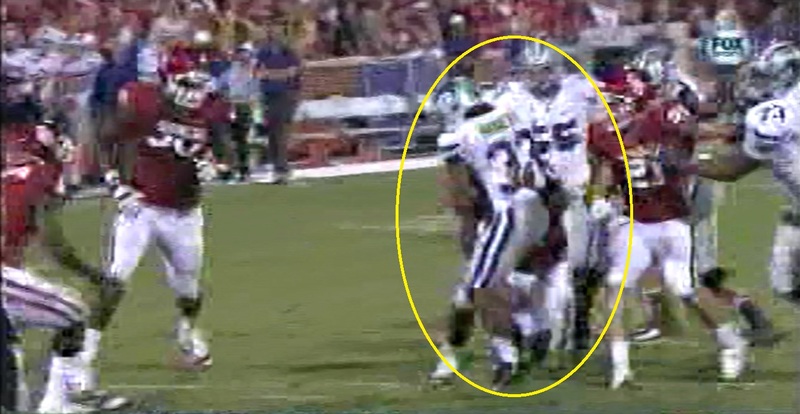 Meanwhile the left tackle is working to the second level to take out the middle linebacker. Hubert doesn’t get the ball on this play, but his contribution is to work down the line and help seal the edge by either blocking backside pursuit for the safety over the top. It is an illustration of the type of smart player that is comfortable with physical play that Synder seeks. This alignment creates a 6-5 scenario in favor of the offense on the left side of the field against defensive personnel playing in a dime, which also lends an edge to the man-to-man match-ups between offense and defense. The next photo is a good illustration of this match-up advantage. 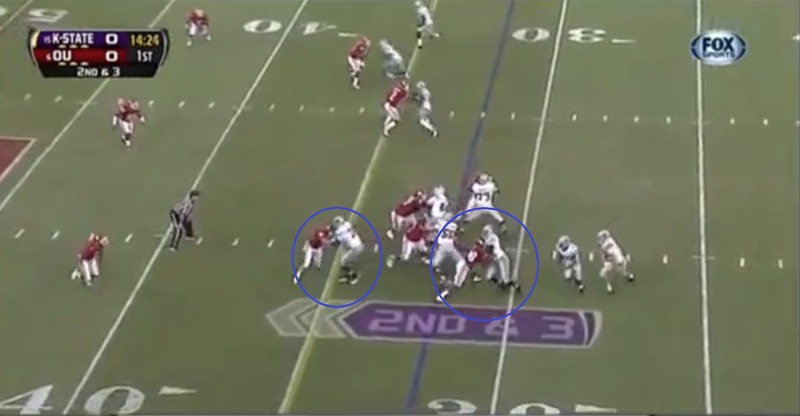 of having the best athletes at the line of scrimmage making the key blocks to set up this run. With a lot of runs, we’re watching wide receivers or tight ends taking on ends and linebackers. In this case, K-State has both tackles sealing the inside while the design of the alignment gives the single receiver a one-on-one with a cornerback split wide from the formation. This should provide a wide alley for the quarterback to run through with his running back serving as a lead, giving K-State a 2-1 match-up in open space. Conceptually this is a winning play because it maximizes personnel strengths against a defensive alignment naturally weaker against the run and it’s set up with enough misdirection that even if the defensive end is thinking a step ahead (zone read to quarterback or running back) he’s being duped to get into position where the pulling tackle gets a clean shot. There are several plays like this ins K-State’s playbook that maximizes personnel numbers and match-ups, but with far different looks. As Hubert leads quarterback Collin Klein around the corner, we see the right tackle (No.78) sealing the defensive end to the backside and the left tackle working the middle linebacker down field at the 35. Barring a slip, it’s next to impossible for Hubert to do anything wrong to prevent Klein from getting another five yards for a first down. 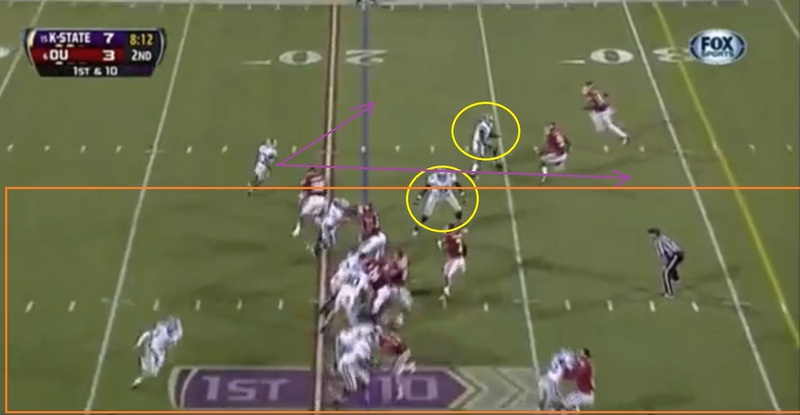 But Hubert does more than the minimum as he gauges the angle of the safety and executes a good cut block. His head is not up as he makes the play, but he does work across the body of the defender and aims above the knee. These two points make all the difference for Klein to get a clean dip inside the block and work behind the left tackle to earn another 12 yards on the play. Here’s the play from start to finish (starting at 0:09 if you have to click off the ad and replay it). Hubert’s cut block achieves its purpose: crumple the opponent at the point of contact. If a cut block gives the opponent room to fall beyond the point of contact then the blocker’s effort was only partially effective, at best. This was Hubert’s first and best block of the night. He had eight attempts as a run or pass protector and was effective or partially effective five times. He’s good at diagnosing blitzes and green dog blitzes and decent at the cut block, but he’s reckless with his form as a stand-up blocker and tends to throw his body around rather than deliver a controlled punch. I think he’s trying to compensate for his size. However, I also like that Hubert plays with smarts. He’s the lead blocker once again on a 2nd-and-eight sweep to left end from a 2×1 receiver, 11 personnel shotgun set with 5:57 in the first quarter, but his left tackle is late getting to the edge. It allows the inside linebacker to get down hill with a strong angle to the quarterback. Hubert is forced to chip the inside linebacker and it delays his angle to the free safety. This allows the free safety to come down hill, get outside Hubert and tackle the quarterback for a loss of a yard. But you can’t blame Hubert unless you preferred the runner to ignore the linebacker because the defender is not his assignment on paper. If that’s the case, the quarterback is probably dropped for a four-yard loss. At least Hubert’s adjustment gave his ball carrier another chance to succeed by making the safety miss. Here’s a touchdown on a similar play in the second half where Hubert has to delay his angle to check the linebacker before taking out another defender to clear the edge for his quarterback. Once again, Hubert makes sure the first defender doesn’t get through before worrying about his own man and it’s this decision-making that leads to K-State earning the advantage. It’s these types of small adjustments that Hubert makes as a blocker, receiver, and runner that defines his game. One of the things that limits Hubert’s game is his lack of game-breaking speed. Here’s another terrific play that results in a 36-yard gain. 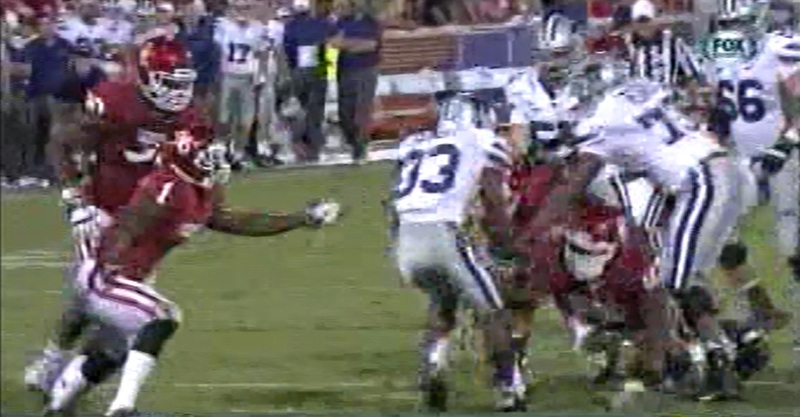 However, I believe if a back with Bryce Brown’s top-end speed gets this carry, it’s a 79-yard touchdown. This time K-State uses the spread, but creates misdirection against a defense with run-stopping personnel to generate a mismatch on the perimeter. 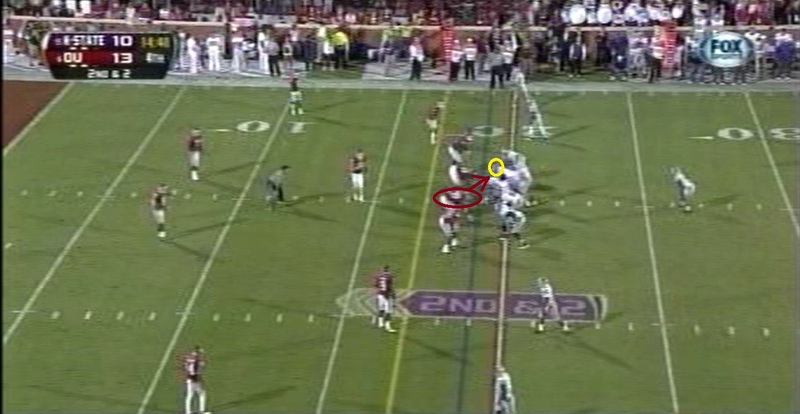 This is a 1st-and-10 from the K-State 21 with 8:13 in the half from a 1×2 receiver, 11 personnel shotgun set. Hubert flanks the quarterback’s strong side versus a 43 defensive look with the strong side linebacker play between the tight end and the slot, which gives this two-deep safety look a nickel feel but with 43 personnel. With 7-8 defenders stationed from the middle to right side of the field – the strong side of the formation – K-State baits the Oklahoma defense by making the play look like it’s going to the strong side when in fact it’s setting up a weak side run to left end where the defense still has the numbers advantage but they have to recover from heading the wrong direction (any player still inside or moving into the orange box) and have more ground to cover in order to make a play on the ball carrier. If the play is executed as designed – and it is – Hubert earns a one-on-one in the open field with a cornerback. Advantage: Wildcats. K-State pulls the guards to the strong side and the left tackle allows the defensive end to move past, hoping the defender will crash down the line as backside pursuit when he sees the guards pulling to the strong side. This opens left end and gives Hubert the choice of a one-on-one with the corner or an alley between the left tackle and the slot receiver. Where Hubert shines is that he takes neither options I presented with the arrows. Instead, Hubert presses the alley inside the slot receiver by making a sharp cut around the defensive end at the edge and this forces the cornerback to bend his hips, stop his momentum, and work towards the wide receiver. Hubert wants both defensive backs to work inside so he can bounce it behind his wide receiver and this press and cut works to perfect. He follows up with a stutter to get outside the wide receiver’s push of the safety inside and is still quick enough to squeeze under the flat-footed corner at the 26. Hubert dips under the corner and hops away from the wrap to his ankles. His footwork to change direction in tight spots and avoid wraps to his lower legs is one of Hubert’s greatest strengths as a runner. Some backs have great speed, strength, and size, but wrap them at the angles or knees and they’re done. Hubert lacks all three of these characteristics but he’s tough for defenders to grasp. Here’s the play from beginning to end. The one thing lacking that the NFL expects from smaller backs is game-breaking speed. Hubert fails to beat the backside safety coming across the field to make the play. There’s a lot of opportunity for him to outrun this angle, but despite the quicks to operate in tight spaces he lacks that final gear to blow by defenders when given the room to open his stride. Still, the change of direction, the press and cut concepts that he also displays as an interior runner, and the footwork to turn good tackle angles into bad ones are all impressive. 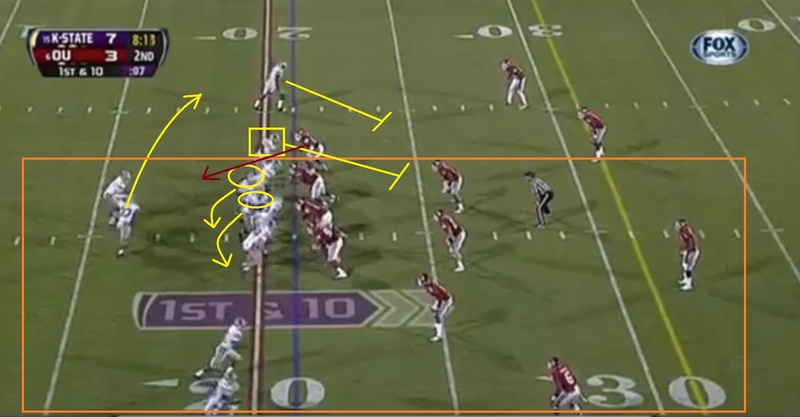 This fourth-quarter play from a 2×2 receiver, 10 personnel set versus a dime look at the Oklahoma 19 is another good example the qualities I just described above. This play is a trap, but the crease behind the right guard is closed shut before Hubert approaches the line of scrimmage because of penetration from the defensive tackle over left guard who crosses the face of the center and blows up the design of the play. Hubert takes it all in stride. 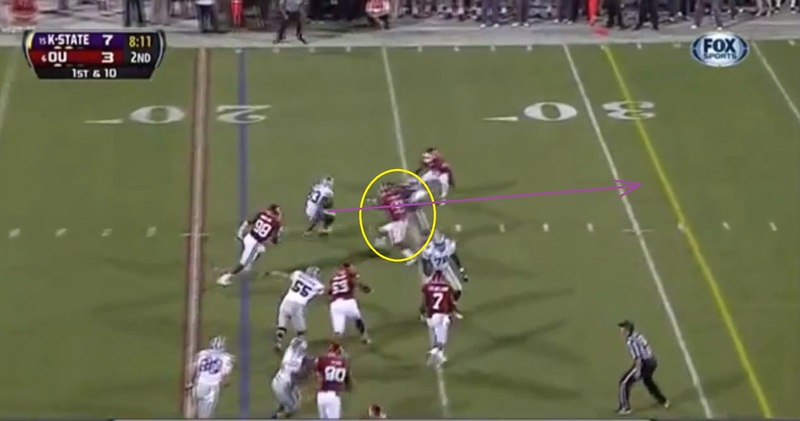 He approaches the line, looks to where the defensive tackle was before the snap and find a wide gap between left tackle and left guard and bends the run away from right side of the line that has been blown up by the Oklahoma defensive line. As he crosses the line of scrimmage the backside tackle gets a bead on Hubert, but is unable to wrap the runner thanks to a quick stiff arm and turn of Hubert’s pads away from the linemen. 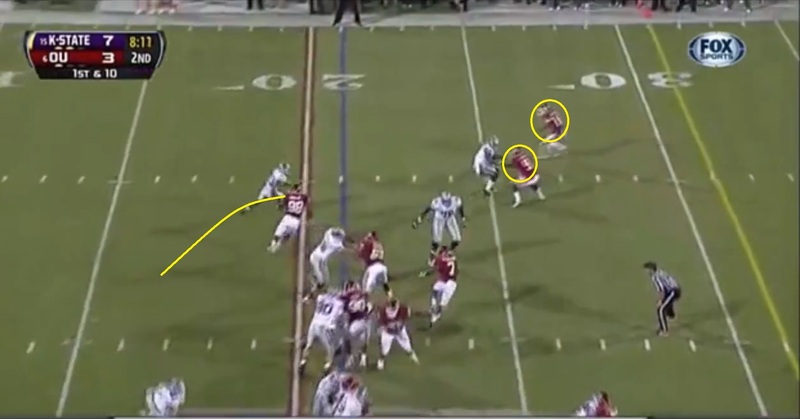 Hubert runs through the early attempt at this wrap and continues down hill for another four yards where the safety wraps and drags the runner three yards later to the eight. Watch the video to see it all put together. 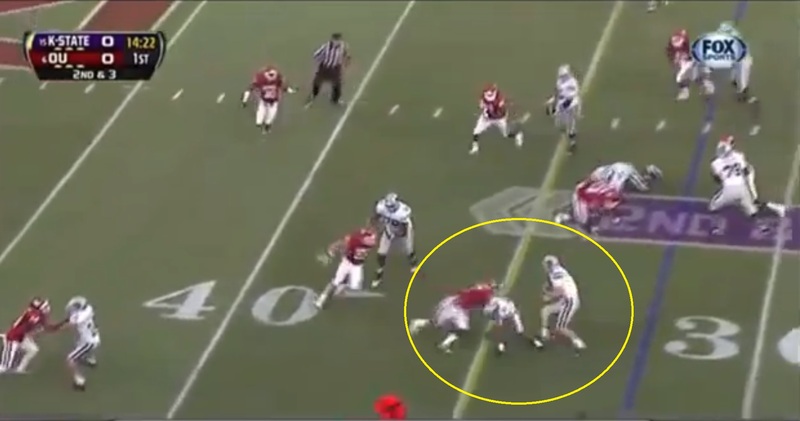 While the defensive tackle “should have” tackled Hubert, you have to credit the runner for being the first to get his hands on the defender and follow up with evasive action. This is why vision, leverage, and footwork in a running back can be as effective as brute strength. It’s the kind of short area skill that Warrick Dunn had at the pro level. The difference between Dunn and Hubert is speed. If Hubert can improve his speed and prove that his shifty style can get the job done against the highest tier of defensive talent, he has the makings of a contributor. While I’m skeptical, I’m looking forward to seeing more from Hubert and K-State’s offensive schemes as I gather more information. Great analysis. Seems like Hubert has what Kenyon Barner needs and vice versa. One small technical thing that bugs me with the youtube video’s is start them 1-2 seconds earlier so we have time to close the pop up ads at the bottom. I’m minor OCD, so feel free to ignore me on that.